We talked a lot about our school commute in August. We were working out the details and attempting to find a fit that was efficient and safe for us. We are pretty settled in our groove now. Brent drives the children to school and locks two bikes to the flag pole (is that legal?). I ride up with Oliver at the end of the day and we all ride home together. The route we settled on that was the safest, most convenient and least exhausting is above. We have mentioned countless times about how unsafe Norway Avenue is to ride a bicycle on, in or near. So why do we continue to walk and bike with our four young children on this street? At first it was a matter of differing perspective between Brent and I. He sees vindictive, drug addled drivers. I am more trusting. After a few weeks I realized those cars are going fast, the side walk is really close to the road and some of the sidewalk ramps turn toward the cars and not toward the sidewalk we are approaching from. There are all sorts of potentially disastrous things about Norway when you mix in three bikes and four children. Yet, not once have I refused to bike or walk because of the posed threats and here is why. We are present in our commute. We do everything we can to remain alert to everything around us. We are not distracted by cell phones, radios, sippy cups, a/c, crying children, maps, make up, lunch or the myriad of other multitasking items we would have been perusing in our car. Our senses are engaged. We are listening to the traffic sounds and watching every approaching vehicle from the front and behind. We can hear a car slowing down behind us and if they are not, I turn and make eye contact to see if they are passing with clearance. I continue to trust the drivers. The process is educational. We stop at every intersection, be it road or alleyway. The children ask if they can cross safely because they understand their judgement is not refined yet, but they are getting there. We are learning the nuances of the route together. The children are learning how to cycle offensively (one step ahead of the driver and road conditions), to be attentive and to work as a team. We are creating a relationship with the traffic. We bike the same route every time. I didn’t realize the importance of this detail until I read “We stick to our favourite routes so we both know exactly where we’re going and can be very predictable for cars.” at Families on Bikes. By being out there on the streets and sidewalks everyday I am building a relationship with the drivers who are there with me. We are beginning to understand each other and respect each others needs. 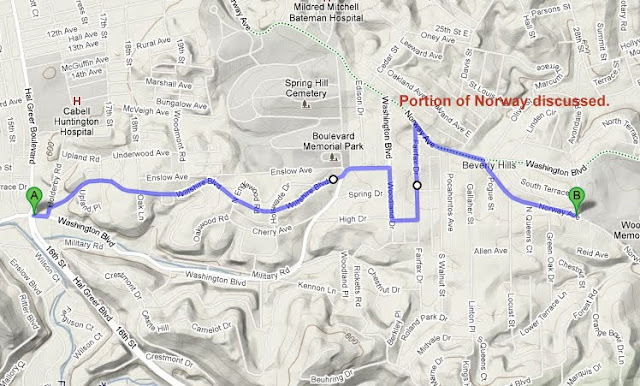 We will continue to travel on Norway Avenue because despite the challenges, we are making choices that are better for us, for our community and we hope for you, even if you don’t see them now. This section is part of the Paul Ambrose trail, so I hope they have some plan for improving it. It’s fine solo, as it’s plenty wide enough if you’re riding in the road, and going east you can generally keep up with traffic anyway. For my money, the section of Norway about half a mile further out of town is way worse, the dip to the memorial park and the subsequent climb. Narrow, no escape routes, no visibility, poor surface, 50mph traffic. Frankly, I’m scared to ride it. They (PATH) do not. I called. They are putting up “Share the Road” signs and calling it done. Solo, it is fine for me too, especially going east, I love to ride in that direction! Brent goes from OLOF to MU on Norway and loves that too, but the climb back up does bite (according to him). Are you talking about the area with cute houses and the cemetery on the right? Love how there are sidewalks some of the time? That’s a “banned” road for me, but we used to drive it almost daily, as my best friend lived in Arlington Park before moving away last year. I never went anywhere close to 50. The audacity of people, it’s crazy. We actually looked at buying one of the homes in there (the Norway stretch), but were turned away by the view of tombstones, lack of back yard and far too much “charm” for me. Maybe you are referring to the Forest Road side? As I guess the other side is actually Washington Blvd. Who mapped this area anyway? Yes, the Forest Road side. Washington is fine, plenty of space over there. My friend Ashley’s husband, Jason, said he wouldn’t have any trouble biking Norway in that area and that he feared Forest more because of the tight space and hills and fast cars…interesting perspectives everyone has. He even watned to take their daughter in the seat with him, as they have friends on Forest. IDK, to each their own? Maybe he just needs to get out there and do it then chime in.